It’s all very well having the lead guitars screaming away and being flash as they like out the front but if there is no bass line pumping away in the background then it all come to naught, flat, dead, thin, meaningless, you get the drift. 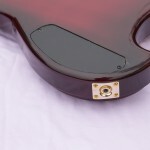 So we were asked to make two bass guitars one of them being a fretless. As usual the woods that went into them were selected from a wide variety of locations worldwide, and some from the house that was knocked down last year. If you want well seasoned timbers that are light hard and dry and have a grain that is very tight also over 80 years old then where else would you look. 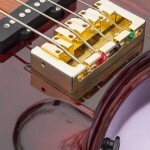 After careful design work we have come up with two very different guitars from each other. 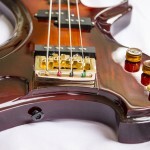 The String theory bass is an enlarged version of the Signature guitar, it looks good and plays very well indeed. 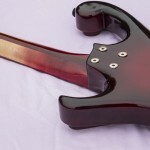 The second guitar the String theory “Hellfire” has more conventional looks, a flat topped bass with a sculpted back. 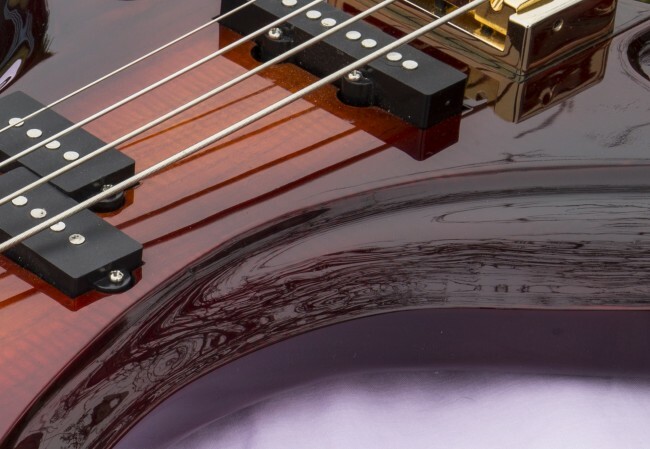 The String theory Signature has a sculpted back and a hand carved front that has the light playing all over it as it is moved., A very high gloss finish. Hellfire has a high gloss finish on the front hut a matt finish on the sides and back just by way of being different and a contrast.